As Business Secretary Vince Cable suggests student fees could be replaced by a new "graduate tax", Channel 4 News's Political Editor Gary Gibbon says there are many politicians from all sides who will back the change. The Treasury is reportedly looking at the possibility of a graduate tax for students rather than a tuition fee hike. This could mean that graduates end up paying for the university education through a special tax once they begin full-time employment. The news comes as Business Secretary Vince Cable prepares to deliver a speech on higher education today. Ms Hunt said: "All the polls show that the general public will not stomach a rise in university fees. If the Government thinks it can get the public to swallow higher fees as some sort of graduate tax, it is living in a dream world. "We need a proper debate on how to fund our universities, not an exercise in rebranding. We will judge the plans on what they actually do and whether or not students will be forced to pay more, not how the Government markets them." The National Union of Students (NUJ) has called for the current system to be scrapped and replaced by a new scheme that would see graduates making contributions depending on how much they benefit financially from their university education. Channel 4 News's political editor blogs from the business secretary's speech: Vince Cable has spelt out a grim economic background – “the worst in living memory” – and said “I just wonder how many people” in the room “are prepared for the economic … contraction”. “We are now 6 to 10 per cent poorer as a country.” You can see where this is heading. Nobody does gloom quite like Vince. He says Labour’s 50 per cent target rate for youngsters going into university is neither sensible nor affordable. On tax, he just said “it surely can’t be right that a teacher or a social care worker pays the same as a graduate who is a city analyst”. So he is investigating a graduate tax. He confirmed that he has spoken to Lord Browne, tipping him the wink that he could profitably refocus extra attention on the graduate tax. We should get a government plan soon after Lord Browne reports in October. The independent review of student funding, led by former BP boss Lord Browne, which could pave the way for higher fees, is due out in the autumn. Shadow Education Secretary Ed Balls said: "As the first Labour leadership candidate to call for a graduate tax, I'm pleased that Vince Cable has followed many of my fellow contenders in backing this idea. "When I was a Treasury adviser I argued for a graduate tax, because it was a fairer system which meant no upfront costs and no assumed debt for students and their families. It means graduates pay a contribution to the cost of their university education, but only once they are in work and clearly based on their ability to pay. "The Business Secretary may be making the right noises on a graduate tax, but his Government is still cutting 10,000 university places this September compared to our plans - a short-sighted decision when we need to be securing economic recovery and investing in skills for the future." Meanwhile, ministers are warning against introducing two-year university degrees amid concerns it will lead to "education on the cheap". The University and College Union (UCU) said universities are not "academic sweatshops" and that such degrees would stop staff carrying out vital research and other work. 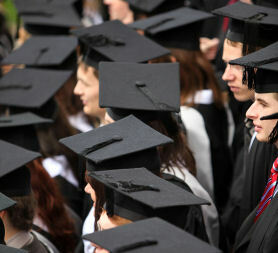 The union is also warning the government against "rebranding" tuition fees and marketing them as a "graduate tax". It claims the public will not accept it. It has been suggested that he will say two-year degrees could transform university for thousands of undergraduates, and allow students to pay fewer tuition fees, as well as leaving graduates with less debt. However, UCU general secretary Sally Hunt said: "Two-year degrees may sound great on paper but are in effect education on the cheap. They would be incredibly teacher-intensive and would stop staff from carrying out vital research and pastoral duties. Our universities are places of learning, not academic sweatshops, and we need to get away from the idea that more can be delivered for less." Channel 4 News Political Editor Gary Gibbon says: "Lib Dem leaders had enough trouble getting their party to swallow a postponement of the abolition of tuition fees in the manifesto (it ended up put off to what some thought was a fairly meaningless distant horizon). The last thing they want to do is find themselves defending a giant hike in tuition fees. "The coalition agreement gave Lib Dem MPs an opt-out allowing them to abstain if they can’t accept the government response to Lord Browne. "So in the interests of both coalition parties, but particularly the Lib Dems, the government is looking seriously at switching to a graduate tax. Four out of the five Labour leadership candidates are talking about a similar shift, so there would be political cover of some kind. Even the National Union of Students has been sniffing round its own preferred version of a graduate tax."